Adulting with kids must be exhausting. Basically kids don’t like sleep (for you or for themselves) and yet they seem to have an unlimited supply of energy. Not having any kids of my own, they kind of seem like little manic balls of terror. I still remember the giant Aesop’s Fables book he read to us each night. It was a cream colored hardback with a forest green binding and a silver embossed title. I would get so excited when he pulled that book off the shelf because one- I was too tiny to reach it myself, and two- it meant it was time for bedtime stories! My brother and I would bug him to spend time with us and my dad was always happy to oblige through reading- half the time my brother and I would listen and the other half we would argue loudly with each other, talk nonsense, and barrage my dad with questions. Now that I think about it, in contrast to our excitement, he must have been so tired after coming home from work. While studying for the bar exam my mom would have to shoo us out of the room so he could study in peace after work, but he would still make time for us. I couldn’t possibly have understood then, and I don’t fully get it now, but I certainly have appreciation for it. I’m truly grateful for the all the little things my parents put up with, and I’m even more grateful for the memories they made with us growing up. 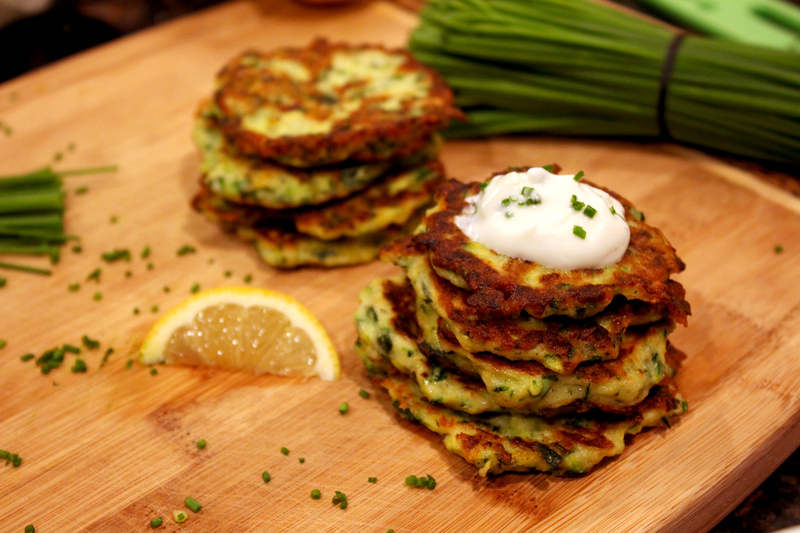 So, zucchini fritters! I made a batch for dinner, and that is what led to that train of thought. Like I said, adulting is hard so I try to keep things simple when I can. 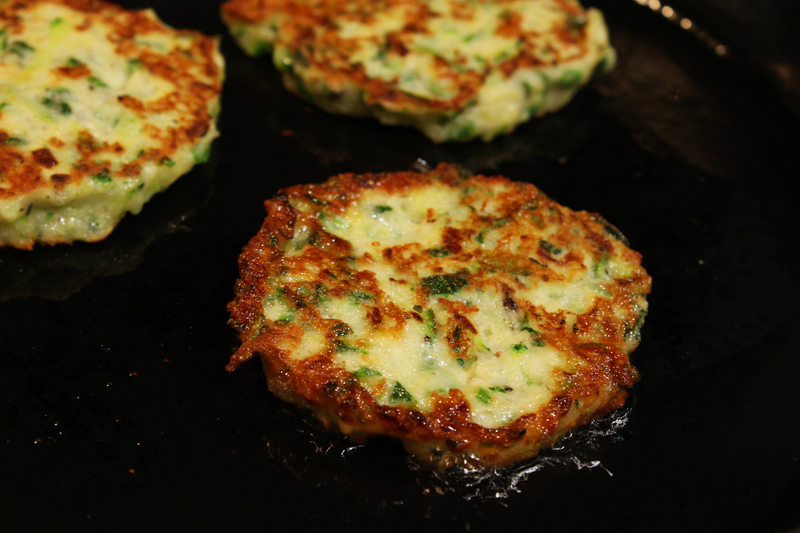 I picked this recipe for zucchini fritters because aside from grating the zucchini and cheese, all you have to do is mix everything together and fry the little cakes. They also looked delicious in all the pictures I saw (though I did change the recipe). This recipe yields about 10 fritters. I would probably double everything next time because between just two people they were finished super quickly! 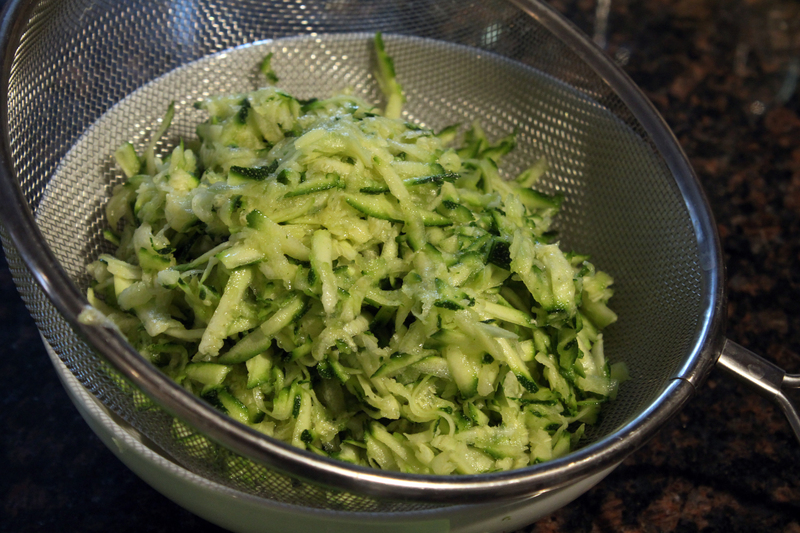 First cut the ends off the zucchini, then grate and place in a sieve over a bowl. add about a tablespoon of salt, to help draw out the water. 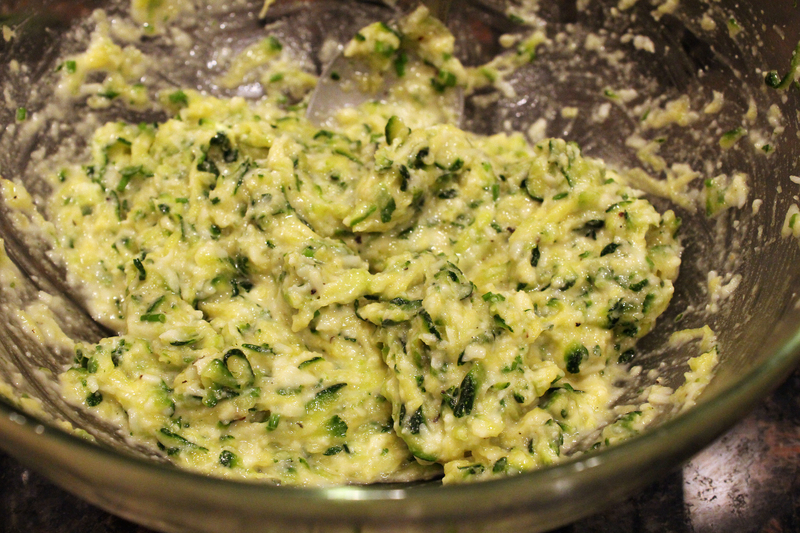 The less water the zucchini has, the crispier the fritters will be. 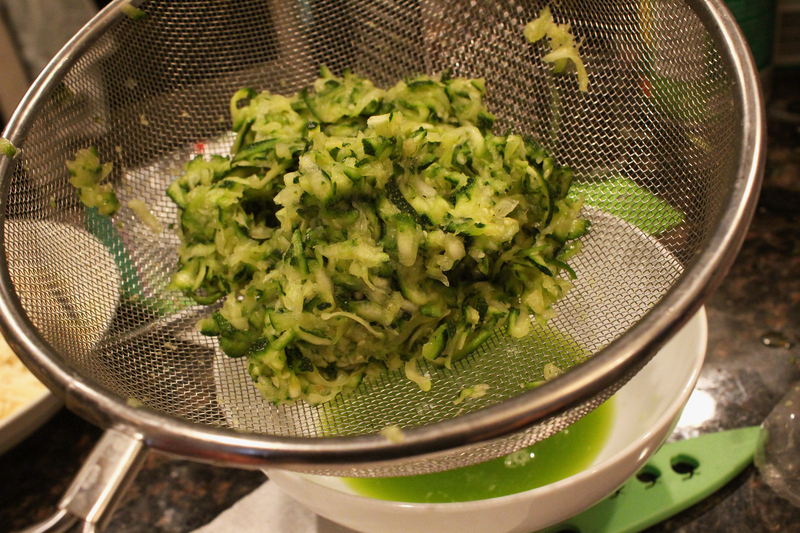 After 20 minutes, squeeze out as much water as you can from your zucchini blob. You’ll be surprised how much green juice is in there. After that, add about a half tablespoon of salt, and place in a bowl. 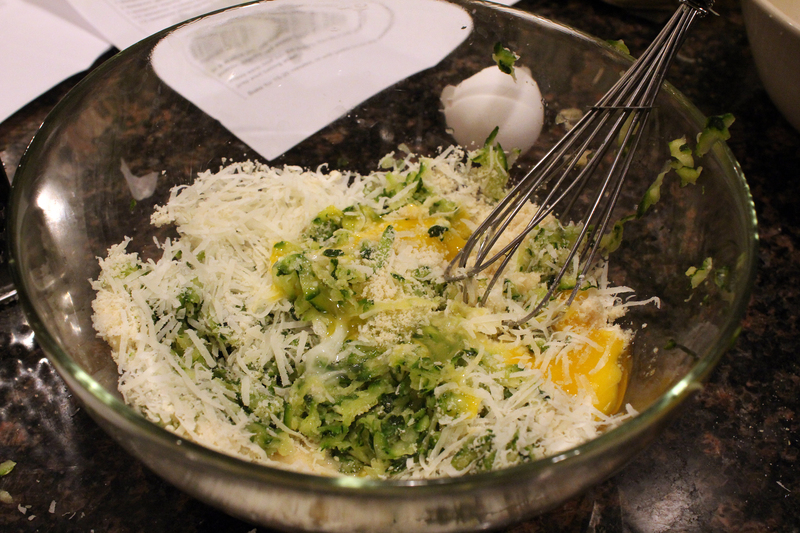 Add the cheese, almond meal, flour, egg, and chives to the bowl. Crack some black pepper into the mix. Not sure why I went with a whisk- do your self a favor and mix with a spoon. Heat grapeseed oil in a skillet pan on medium/high heat. Prepare a plate with a paper towel on it. 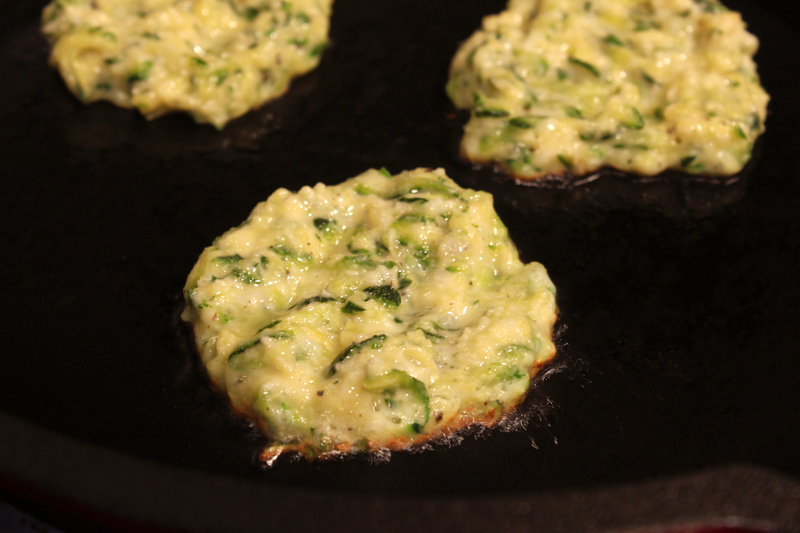 Once the oil is hot, add spoonfuls of the zucchini mixture to the pan 3-4 at a time, pressing on the tops of the cakes so they are flat and round. Once the bottoms are golden brown, flip. Each size should take only about 2-3 minutes. Place on paper towel to absorb excess oil. Once the batch is done, serve immediately. I served mine with a tangy tzatziki sauce! These fritters looks great! 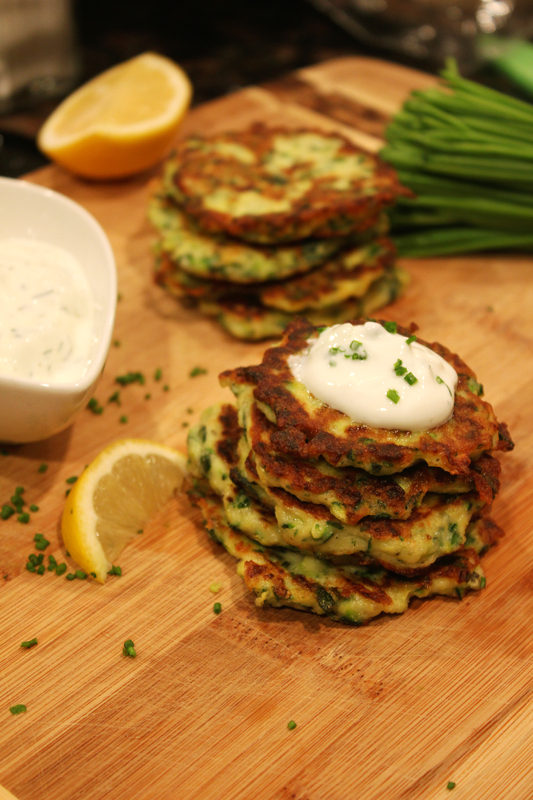 I love zucchini and fritters is always a lovely way to eat them!